Fisheries are a surprisingly common reason for conflict between countries. Between 1993 and 2010, 11 percent of militarized interstate disputes (MIDs) – conflicts short of war between two sovereign states – involved fisheries, fishers, or fishing vessels. While the conflicts often involve fresh fish, the implications for global peace and prosperity stink like fermented herring. As climate change threatens to change fish habitats, new governance strategies may be needed to prevent these “fishy MIDs” from sparking broader conflicts. The economic logic is simple enough: While markets can deliver fish across borders to consumers, profits from fisheries only accrue to those who physically harvest the fish. Thus, there are strong domestic interests in expanding fishing rights claims and quotas under managed systems. Many fish are migratory, and their migration patterns have no regard for human territorial claims, such as those codified in the UN Law of the Sea. Often, this results in fishers following fish as they swim across territorial boundaries into the waters of other sovereign states. Fishy MIDs follow a basic template: A country attempts to enforce a maritime boundary that is not recognized (or at least not obeyed) by a rival country’s “foreign” fishing vessels, usually by boarding or firing upon the foreign vessel. Upon interdiction, boarding, or even sinking by the “home” country’s navy or coast guard, the foreign fishing vessels then call on their country’s navy for protection, precipitating a naval standoff. In some cases, navies sink or fire upon fishing vessels flagged to third countries. These conflicts are typically initiated by privately owned vessels, rather than the navies themselves. In addition, these MIDs are distinct from the boat-on-boat violence we’ve seen with illegal, unreported, and unregulated (IUU) fishing. These conflicts are prominent in regions of significant geostrategic import. 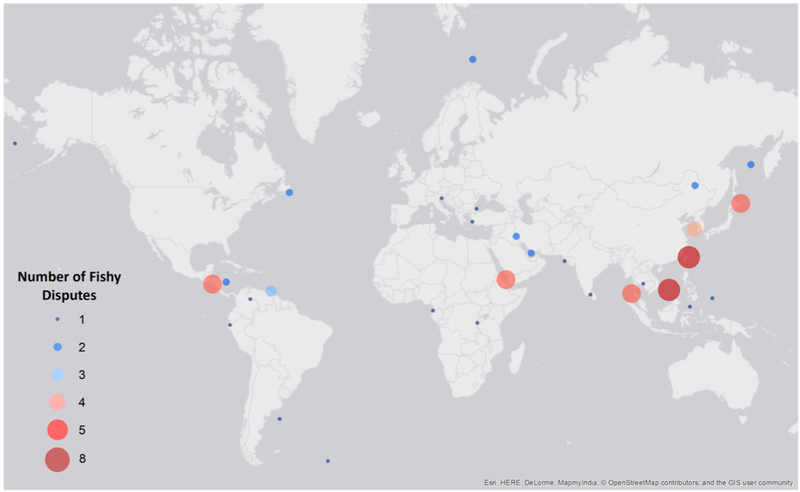 Our map of fishy MIDs that occurred during 1993-2010 shows clusters in the China Sea, the Gulf of Aden and Arabian Sea, and in Central America – all of which are maritime hotspots for a host of other reasons, including piracy, oil and gas drilling, narco-trafficking, new territorial claims, and geopolitical competition. But fisheries are definitely among them. These conflicts often involve countries that don’t often find themselves in interstate disputes. For example, the Philippines was involved in 5 percent of all fishy MIDs from 1993-2010, but was involved in only 0.4 percent of MIDs involving all other issues during the same timeframe. Honduras and Nicaragua are involved in fishy MIDs 8-10 times more frequently than they are engaged in other MIDs. 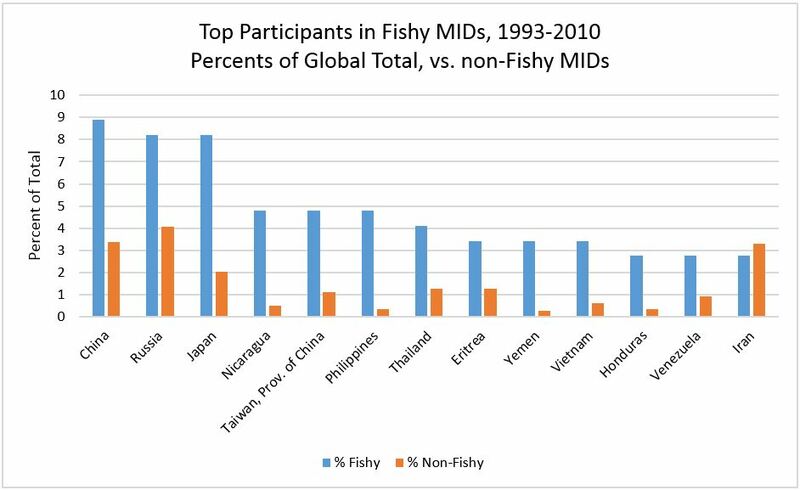 Major powers like China and Russia are also involved in a larger share of fishy MIDs than non-fishy MIDs. These conflicts can escalate, both militarily and diplomatically. James Stavridis, the 16th Supreme Allied Commander of NATO and current dean of the Fletcher School of Law and Diplomacy, has warned that fisheries-related tensions could escalate into a “global fish war.” Already, we see evidence that fisheries-related disputes are causing diplomatic rows and endangering broader economic and diplomatic relationships. While fish would likely be only one of several issues at the heart of any major escalation, they could spur one of the few “wild card” scenarios in which the navies of competing powers are brought to the brink of engagement by the actions of third parties that they neither command nor control. Under these circumstances, slight miscalculations or misunderstandings may spiral out of control. Climate change could increase the risk of these conflicts. Just as people may flee increasingly uninhabitable ecosystems, fish will seek to adapt to warming oceans by moving to new environs. Unlike humans, fish don’t carry passports and have no regard for international boundaries. The fishers that depend on them, however, do. As their meal tickets swim across borders, they will be hard pressed not to follow the fish. At the same time, sea-level rise will change the terrestrial baselines on which territorial sea claims depend, turning land into ocean and complicating the delineation of maritime boundaries. In turn, these boundary disputes could potentially lead to interstate conflicts—as is already occurring among countries with large distant water fishing fleets, like China, Japan, and Russia—and may result in even more countries being caught up in fishy MIDs in the future. What can be done to mitigate fisheries-related MIDs? While better enforcement of maritime boundaries might help by reducing uncertainty and deterring border crossings, unilateral efforts to pursue such ends are likely to be provocative: The naval assets needed to effectively patrol the South China Sea could also be interpreted as a threatening buildup of offensive capability. Similarly, treaties may provide a basis for both addressing security concerns and guaranteeing parties’ economic rights, but these treaties can be undone by changes in perceived national interests. Finally, creating coordinated, multinational maritime response teams and sharing information could help prevent “wild card” conflicts, as we’ve seen in efforts to address piracy in the Gulf of Aden. Climate change, increasing demand for fish from growing populations, and rising military ambitions of regional powers all combine to make future fisheries-related conflict a significant threat to global peace and security. We urgently need new thinking about this fishy problem so we can create institutions and mechanisms for managing these potentially dangerous disputes. Cullen Hendrix is Associate Professor at the Josef Korbel School of International Studies at the University of Denver and Nonresident Senior Fellow at the Peterson Institute for International Economics. Paige Roberts is Project Officer in the Secure Fisheries program at the One Earth Future Foundation in Broomfield, Colorado. Secure Fisheries combines science-based research with a policy-oriented approach to combat illegal fishing and support sustainable fisheries. Operating primarily in Somalia, Somaliland, and the Lake Victoria region, it serves as a bridge between security efforts at sea and stability and prosperity efforts on land. More information can be found at www.securefisheries.org. 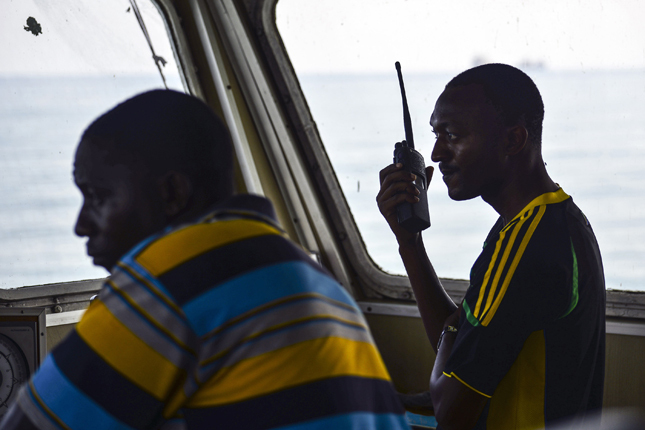 Photo Credit: A fisherman radios in an illegal fishing scenario during Exercise Cutlass Express 2013, a multinational maritime exercise in the waters off East Africa to improve cooperation, tactical expertise and information sharing practices among East Africa maritime forces. U.S. Air Force photo by Tech. Sgt. Chad Thompson.